This is the more “expected photo” of a grizzly bear than yesterdays posting. 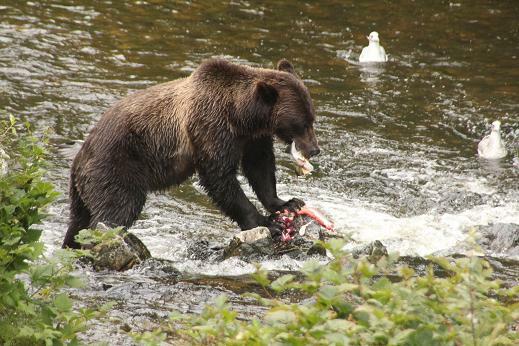 In late August once the salmon have arrived in the rivers of Knight Inlet the grizzlies have access to their preferred food – salmon. This is the food that provides the necessary calories for the bears to add the layer of fat need for them to survive hibernation. This bald eagle was coming in to pick up a rock fish to take back to it’s young in the nest behind our lodge. 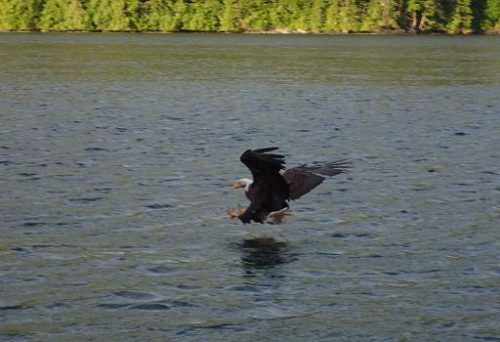 Know these facts because if you are visiting our lodge when there are rock fish leftover from a fishing trip we feed the eagle. Pavlov‘s dog psychology also works on bald eagle: whistle, wave a fish and good photo opportunity occurs.